Originally published under the title, "Exposed: Egypt's Institutionalized Persecution of Coptic Christians." According to Bishop Agathon, the plight of Egypt's Christians has gone "from bad to worse." In a 25-minute interview on Arabic satellite TV with Dr. Mona Roman, Coptic Christian Bishop Agathon fully exposed the plight of his Christian flock in Minya, Egypt—a region that has a large Coptic minority that is steadily under attack. While several important points were made, most notable was that the Egyptian State itself is often behind the persecution of and discrimination against Christians. According to the frustrated-sounding bishop, local governmental authorities—including the State Security apparatus—are not just ignoring the attacks on Copts, but are often the very ones behind them. For example, when the Copts were having a serious council meeting with government officials about the possibility of building a church, one of the authorities actually contacted the Islamic sheikhs of the village asking whether they "stand with the Coptic church or with the State?" If the latter, each Muslim household was instructed to send one family member to protest against the proposed building of a church—so that security can then point to the mob and, as usual, just tell the Copts, "Sorry, no can do." Other times, State Security is complicit: Male and female Christian minors—currently 21 from just Minya alone said the Coptic leader—are habitually abducted by surrounding Muslims. At the moment, the youngest Christian girl abducted had just started elementary school. Whenever any of these attacks occur, Copts, working with the church, prepare bundles of documents, including photos and other verifications, incriminating the culprits. These then are placed into the hands of top officials, to make sure they don't get "lost" or "misplaced" by underlings. The bishop named many of these top people—at no small risk to himself—and said he even put such proofs and documents into the hands of the Director of Intelligence himself. "Absolutely nothing was done," said the despondent Christian. He discussed the difficulties that Copts encounter whenever they want to build a church—due to their dearth, some of the current churches serve tens of thousands of Christians—or even make simple repairs. By way of example, he explained how the Virgin Mary Church in Safaniya village has no bathrooms or running water. Christians "tried time and time again to get approval to build bathrooms, to no avail." The bishop lamented how elderly and sick people sometimes urinate on themselves during service, while mothers must change their crying babies' diapers right on the pews. In response, authorities told the bishop to "Go and ask the Muslims of your region if they will approve the building of a church, or bathroom, or anything—and if they do, so will we." Clearly frustrated, the bishop added: "We as Copts are human beings. And envy takes us when we see our Muslim brothers build mosques where they will, how they will, at any place and at any time. And the State helps them! But as for us, we cannot build anything and that which is already open is being closed…. We, the Copts, are citizens with rights; and we see Muslims get whatever they want, while we are always prevented." The Coptic bishop also said that sometimes Christians are punished whenever they go and "bother" authorities about their treatment. For example, when a Coptic delegation went to make a formal complaint, one of them was immediately kidnapped. His kidnappers demanded and received 120,000 Egyptian pounds for his release. Police were notified—even told where the exchange of money for hostage was to take place—but did absolutely nothing. 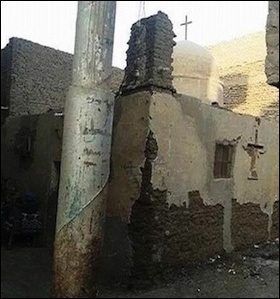 The bishop referred to this incident as a "punishment" while Dr. Roman, the Coptic hostess, called Minya, Egypt a "State of Retribution" against those Copts who dare refuse to suffer quietly," adding, "Al-Minya is apparently not an Egyptian province; it is governed by ISIS." Finally, Bishop Agathon made clear the despondency he and the average Christian in Egypt feel, repeatedly saying that, no matter which official they talk to, "nothing will change." If anything, the plight of Egypt's Christians has gone "from bad to worse," said the bishop: "We hear beautiful words but no solution." Dr. Roman concluded by imploring Egyptian President Sisi, saying: "I've said it before: President Sisi is very meticulous and aware of the nation's issues. Why, then, is it that the Coptic plight in Minya is being ignored? Why is he turning a blind eye toward it?" 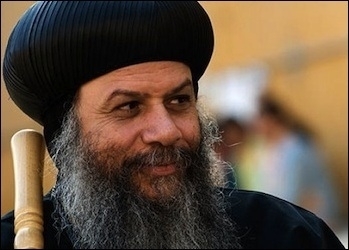 Bishop Agathon concluded by saying that "Copts are between a state anvil and aggressor hammers," meaning that, the state serves only to keep its Christian citizens in place while Islamic radicals pound away at them. Raymond Ibrahim is a Shillman Fellow at the David Horowitz Freedom Center and a Judith Friedman Rosen Fellow at the Middle East Forum. He is the author of Crucified Again: Exposing Islam's New War on Christians (2013) and The Al Qaeda Reader (2007).